It is always very disheartening to see anyone get killed in a car accident even if the vehicle is a high performance all-wheel-drive Italian sports car. 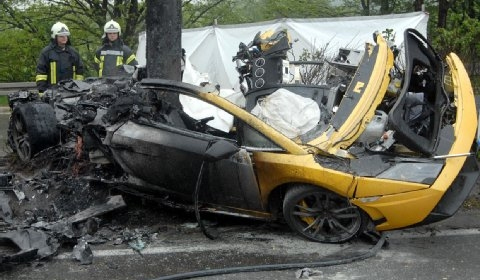 In this specific case it was a Lamborghini Gallardo out on a Demo Test Drive in Germany where the male driver lost control of the vehicle killing both him and his female passenger. Eyewitnesses said that the driver gave it a bit too much throttle in the wrong circumstances causing the vehicle to skid against a carriageway divider then resulting in the car flying through the air, hitting a lamppost and then bursting into flames. The cost of this vehicle does not amount to anywhere near the cost of the two lives lost. Let this be a reminder to everyone on the road to be careful, don’t do anything stupid and please put down that cell phone (don’t text and drive). May God be with the families of the two killed in this accident!